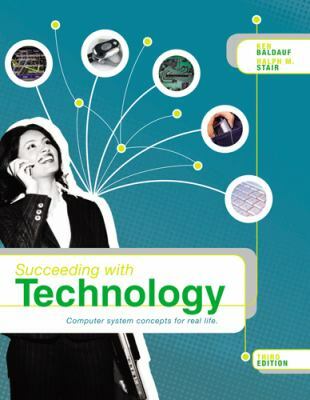 by Baldauf, Kenneth J., Stair, Ralph M.
Baldauf, Kenneth J., Stair, Ralph M.
Succeeding with Technology - Third Edition presents the latest ways to get ahead and lead a successful, fulfilling life with technology. Building off the innovative approach from previous editions, it focuses on the newest trends that are impacting the way we live, while providing just the right amount of foundational concepts to provide a thorough understanding. By focusing on the application of technology and how technology may be used by learners for personal and professional gain, this text gives learners the information they need to prosper.Baldauf, Kenneth J. is the author of 'Succeeding with Technology, 3rd Edition', published 2008 under ISBN 9781423925293 and ISBN 1423925297.